The alternative he suggests is called "progressional dialogue." This concept is fairly simple. Instead of doing all the talking, the preacher allows time for discussion. Her opinion is not the only one that counts. Preparation is not done by the pastor, alone in a study, with commentaries as basically her only source of information. At Solomon's Porch, the church Doug Pagitt serves in, they have a gathering every Tuesday night where the passage for that week's "sermon" is reviewed and discussed. This helps to shape the thoughts that Doug will share on the following Sunday. My only problem with the book is that it did not provide much in the way of "how to" information. 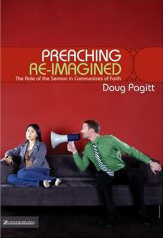 Most of the book is spent trying to convince us that preaching needs to be re-imagined. Unfortunately, I began the book already convinced and was hoping for a little more in the form of practical suggestions. I think that the author could have shared more insight about how he has made "progressional dialogue" work without being overly prescriptive. Perhaps he could have even interviewed other pastors who are trending away from "speaching" in order to share what has worked for them. I realize that there is always a danger of people thinking they should just mimic other ministries, but having personally experimented with this, I think that some more real life examples of what has worked would be helpful. Overall, I recommend this book to anyone who preaches or is planning on preaching sometime in the future. I'm convinced that some things need to change and I hope many more people will be, too. To hell with being practical! I just finished it as well. I agree that it would be nice if there was an appendix or chapter on what he has found to work/not work. I am experimenting with it at ou r church, which is new and in formation, which makes it easier to try. I wonder how an established church, with pews and all, would make it work with their architecture already fixed for speaching. I heard about this book a month ago or so. It sounded very interesting. I'll be "preaching" November 13th and 20th while my pastor is on Sabatical. I'm a little scared to be sharing for 30-40 minutes from the pulpit for the first time. Maybe I'll just go with what I know works. On the other hand, perhaps it would be helpful to the church if we tried something new!